I’m happy to announce that I’ll be taking part in Databit.me #2 in Arles, France from 13-20 October. 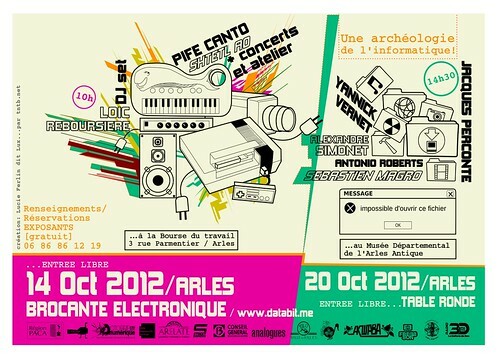 This year Databit.me offers an “electronic free market” on 14th October 2012 in the main venue of the festival in the centre of the city of Arles. As in previous editions, we will conclude with party and its international line-up, that showcases electronic music, VJ and other digital experiments, several of them will be create during a session of residencies during the week. In short, lot of artists to discover, throughout the week. An Archaeology of the computer! I’ll be working throughout the week with Gijs Gieskes and others to create an “Open Camera” that is built from easily accessible components. I’ll be doing a short performance at the closing party, also on 20th October. The night will feature performances from a wide range of artists, including 69DB, JUNIOR CONY & Sista Chance, THX1137, BITCRUSHER & MORUSQUE, HASSAN K and many more! There’ll otherwise be entertainment in the evenings and workshops. Lots more information is available on the main databit.me website and their Page on Facebook. If you feel like sharing, here’s some posters for the festival. In completely unrelated news I recently started to learn French.